Can we just take a moment to celebrate the return of the Premier League this weekend? CHEERS. Relative to Euros last year and a quiet work front, that break was the longest ever. So long I almost forgot the thrill of watching a goal scored. When I received the invite to the inaugural International Champions Cup (ICC) Singapore in my mail, it was no joke, like finding water after having walked the desert for miles. Lucky for me this was no mirage! Of the three matches, I caught the last two. I was really looking forward to watch Bayern Munich play but the game versus Inter Milan was tame at best. Granted, intensity and pace are not what you'd expect from a friendly because god forbid anyone gets injured weeks before the start of a new season. I had been to the Sports Hub before for the WTA finals but that was held in the Indoor Stadium. 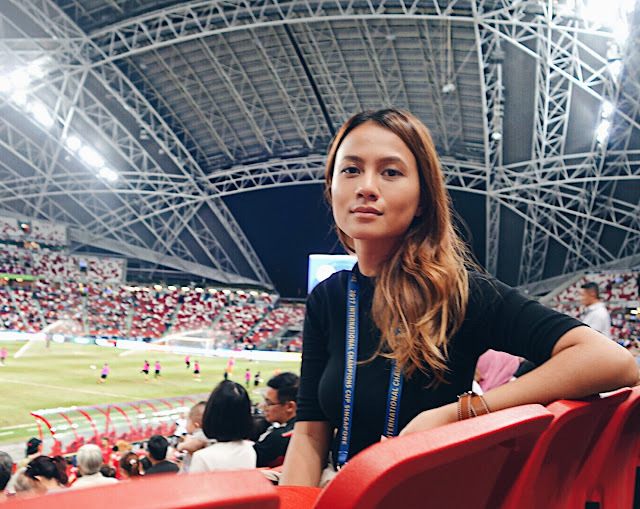 So this was actually my first time in the National Stadium and honestly, Singapore, you get it right every time. Bowl cooling air system pumped from under your seats? Win. In between match days we custom made perfume at Oo La Lab and visited the National Gallery. I can't believe I'd overlooked it all these years. I mean, every Malaysian pretty much travels to Singapore at least once a year but have you ever given the National Gallery a thought? No. Which is odd since I love visiting museums and art centres when I travel to Europe or the US. The Yayoi Kusama exhibition aside (because that alone is reason enough to visit), the gallery is stunning. It reminded me so much of the Tate and even a smaller version of the Met. Even if you're not an art fan you should pop by the cafe downstairs to get a glimpse of the cultured. was a lot more exciting. An Inter win would guarantee them winners of the tournament and Chelsea did as much as they could to stop that. More goals, a foul, a penalty - you get the drill. With wins over the champs of Germany and England, Inter deserved to take home the ICC cup. While stadium numbers weren't overwhelming - to be fair it's the first year - the organisation of the tournament was pretty much flawless and up to international standards. The ICC Singapore experience wouldn't be complete without this. We stayed at the Marina Mandarin with this view from our room. We weren't sponsored by the hotel but they were really hospitable and took care of us so well throughout our stay by bringing over drinks and snacks to our room, giving access to the lounge (which serves chilli crabs guys!!!) and delivering clothes I left behind right back home to me. I'm so eternally grateful to be reunited with my favourite cardigans - so here's a big thank you to the employees at Marina Mandarin especially Ravi for going above and beyond with their guests. Bonus tip: you even get a view of the National Stadium from the lounge at the 21st floor!